Sligh clock Repair/Technical Info Help! 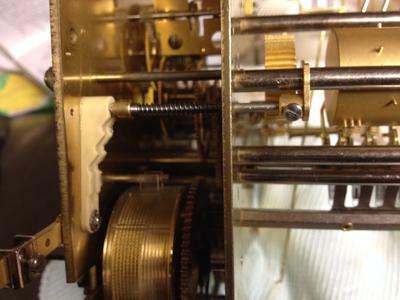 I am having an awfully difficult time adjusting chime melodies on a top of the line Sligh, with factory bronze bushings and jeweled escapement. 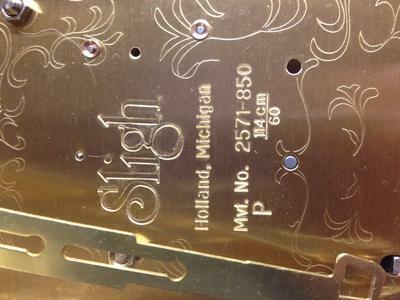 Since the Sligh company is out of business, am unable to get any technical info directly from them. My problem is in the setting/adjusting of the position of the drum with pins in order to get all four tunes properly playing, including the 4/4 Silent and All Silent settings. 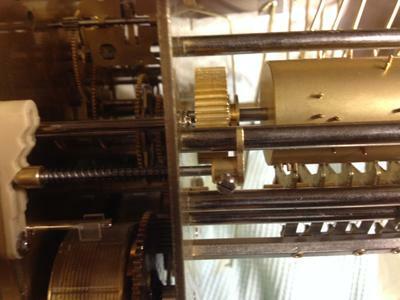 When I acquired the clock, the chimes were already out of adjustment so could not see the correct alignment of all the components - specifically the thumb with the set screw which engages in the drum groove. No other parts were disassembled and after cleaning and lubrication, the rest of the clock is performing well. I have significant experience in clock repair, having been European trained with my own clock repair business for over fifty years (now retired), but these chimes are giving me a bit of a nightmare. The enclosed pictures show the selector lever all the way down, which is supposed to be a Westminster tune. However when activated, it does not play correctly. I would greatly appreciate your help with this problem!